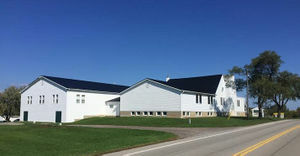 St. Ann's Community Church began worshiping on 10 September 1967 as an outreach program of the Vineland Mennonite Brethren Church, located about 10 miles (16 km) northeast of St. Ann's. The St. Ann's United Church building was rented for two years, with the option to buy. In 1969 the Vineland Mennonite Brethren Church bought the building for $3,500. Although seen as a community church, church life and polity was Mennonite Brethren. Henry H. Wiebe was the founding pastor of the group. The congregation soon began a popular summer Bible school program, and in the early 1970s added a bus ministry to bring children to Sunday school, as well as Pioneer Girls and Boys Brigade programs. In early 1971 the congregation completed an addition to the building, adding sanctuary space, three Sunday school classrooms, pastor's study, vestibule, and additional classes, kitchen and washrooms in the basement. By the mid-1970s only 25 percent of the membership had Mennonite background. In summer 1976 the St. Ann's congregation formally organized separately from the Vineland Mennonite Brethren Church, and took over ownership of the facility. The charter membership was 125. St. Ann's was an independent congregation for a number of years, despite the original support of the Vineland Mennonite Brethren Church. It joined the Ontario Conference of Mennonite Brethren Churches in 1999. Brandt, Susan B. "Bible teaching a highlight." Mennonite Brethren Herald 38, no. 7 (2 April 1999): 16-17. Durksen, Sheila. "St. Anns pushes out its wall." Mennonite Brethren Herald 10, no. 6 (19 March 1971): 10. Janzen, Martha. "Many volunteers help church grow." Mennonite Brethren Herald 15, no. 11 (28 May 1976): 15-16. "New community outreach." Mennonite Brethren Herald 6, no. 40 (24 November 1967): 12. "News from St. Ann's." Mennonite Brethren Herald 12, no. 4 (23 February 1973): 19. "The Vineland (Ontario) Church." Mennonite Brethren Herald 6, no. 28 (1 September 1967): 20. Steiner, Sam. "St. Ann's Community Church (St. Ann's, Ontario, Canada)." Global Anabaptist Mennonite Encyclopedia Online. February 2017. Web. 25 Apr 2019. http://gameo.org/index.php?title=St._Ann%27s_Community_Church_(St._Ann%27s,_Ontario,_Canada)&oldid=147284. Steiner, Sam. (February 2017). St. Ann's Community Church (St. Ann's, Ontario, Canada). Global Anabaptist Mennonite Encyclopedia Online. Retrieved 25 April 2019, from http://gameo.org/index.php?title=St._Ann%27s_Community_Church_(St._Ann%27s,_Ontario,_Canada)&oldid=147284. This page was last modified on 23 February 2017, at 18:29.